I came across a recipe on Pinterest for crock pot lasagna. 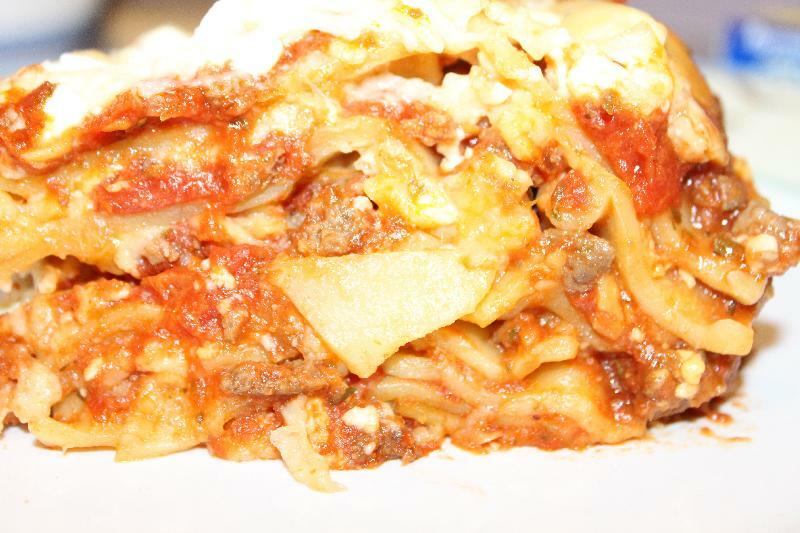 (This recipe) I admit the concept of a lasagna in the crock pot intrigued me. I love the recipe my Mom uses to make lasagna. It takes a lot of time. Between making the sauce and letting it cook for a few hours, assembling the pan of lasagna, and then letting it bake it tires me out. Not to mention with living in Florida sometimes you just don't want to bake something in the oven. So I combined the recipes to make a delicious meal! I used the sauce my mom uses but the process of cooking it in the crock pot from the first recipe. Basically my Mom's lasagna in a crock pot! I admit, I was totally surprised at how well lasagna can be made in the crock pot! I would really have loved to include ricotta cheese in this as my mother does, but the store was out! I went with the cheese from the first recipe. Next time I make this it will have ricotta! Line a crock pot with a liner or spray with cooking spray. Brown the ground beef in a large pot and drain the grease. Next stir in the tomato paste, garlic powder, onion powder, oregano, and Italian seasoning. Then put in the stewed tomatoes, as you put them in squeeze them with your hands. Mix up everything in the pot. Place 1/4 of the meat sauce on the bottom of the crock pot. Arrange 1/3 of the noodles over the sauce. In a bowl mix the cottage cheese and mozzarella cheese. I then spread a layer of sauce over the noodles. Then I spread 1/3 of the cheeses over the sauce. Next I put another layer of noodles on. Let the lasagna stand for 10 minutes with the lid off before serving. Serve with your favorite garlic bread!